He looked at prison like a chess game: a thinking game that could be outsmarted. Chris Wilson was sentenced to life in prison for murder at age 17. These days, he's a free man who heads up two Baltimore companies and has been honored at the White House twice in the past month. He's currently in talks with publishers to write a book about his life. After all, his journey has all the makings of a Hollywood story: poverty, addiction, gun violence. 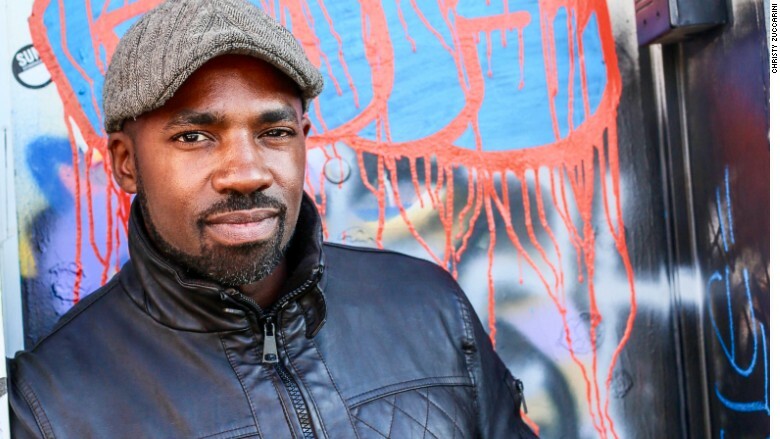 He grew up in rough neighborhood in Washington, D.C., sandwiched between two housing projects. There were days where he'd step over dead bodies on his way to his grandmother's house. But his life is also marked by a turnaround that's against the odds. A conversation with his dying grandfather early in his prison sentence instilled what he refers to as "positive delusion," the belief that one day he'd be out in the real world, making it a better place. "Promise me you'll turn your life around ... You can do it. Promise me you'll try," Wilson recalls his grandfather telling him. So Wilson set goals for his life: Graduate high school and college, travel, buy a home, write a book, and become an active member of his community. Wilson, now 38, typed them out on in the prison computer lab and printed out three copies: for the judge, his grandmother and one to post in his bunk. Everything he did was in pursuit of this "master plan." He befriended another young man in prison, Stephen Edwards, who also had a life sentence. Edwards would scrawl computer code on paper and dreamed of starting a software company. A stack of Wilson's journals from his prison days. The two spent every day studying. Edwards would task Wilson with timed math problems. If Wilson couldn't complete the problem -- or got it wrong -- he'd have to drink a glass of water and do 25 pushups. Wilson, who played chess and the cello growing up, said he "learned how to learn" because of Edwards. They had subscriptions to business news, from Fortune and Forbes to the Wall Street Journal and Inc. They'd read them and compare notes. "We thought, 'We're going to be that one day. We can't allow ourselves to be institutionalized,'" Wilson said. "Everyone else thought we were crazy." Wilson learned Spanish, completed a basic resume in the prison computer lab, and researched job opportunities. (He couldn't access the Internet on his own but would put in requests for Google searches of specific companies, which would be printed out and given to him.) 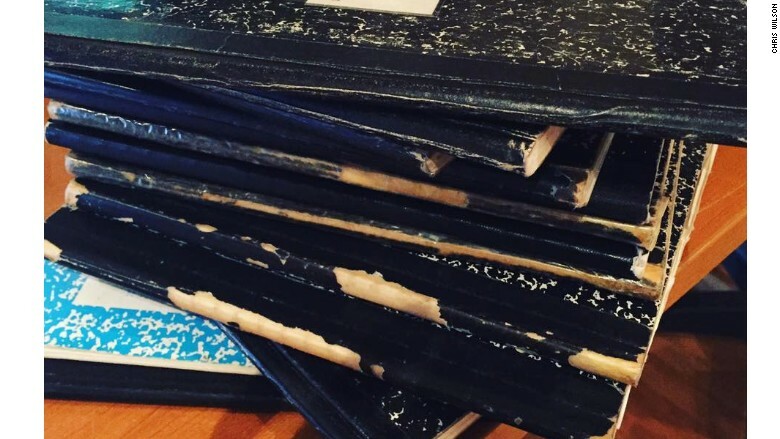 He journaled every day. Related: Troy Carter: Who said black founders can't build a billion dollar company? In prison, Wilson began flexing his entrepreneurial skills. He and Edwards started a photography business after reading about digital cameras in Popular Science. They sold photos of prisoners with their loved ones. By the third year, they brought in $40,000. Year after year, Wilson achieved or exceeded the goals he'd set for that year. After 16 years, Wilson's life sentence was reconsidered, and he was released. "Your accomplishments are nothing short of amazing," Wilson recalls Judge Cathy Serrette telling him. His task was to continue on his master plan: "You put some pretty ambitious stuff on this plan ... I'm going to be watching you," she told him. Today, Wilson heads up House of DaVinci, a furniture restoration and upholstery company, and Barclay Investment Corporation, a residential and commercial contracting firm. He's earning his bachelor's degree in business at the University of Baltimore. "He's a dreamer who can execute," said Danielle Giles, director of communications of Baltimore's Merrick School of Business. In the past month, he's been invited to the White House twice in recognition of his social impact. He also appeared in a Bernie Sanders video, which told his story and stressed the importance of education. Wilson said more than 300 people have seen it and reached out to him in the past week. Through his companies and his role at Strong City Baltimore (where he worked for three years after being released in 2012), Wilson has helped 230 people get jobs. He estimates that 60% are people like him, just out of prison. 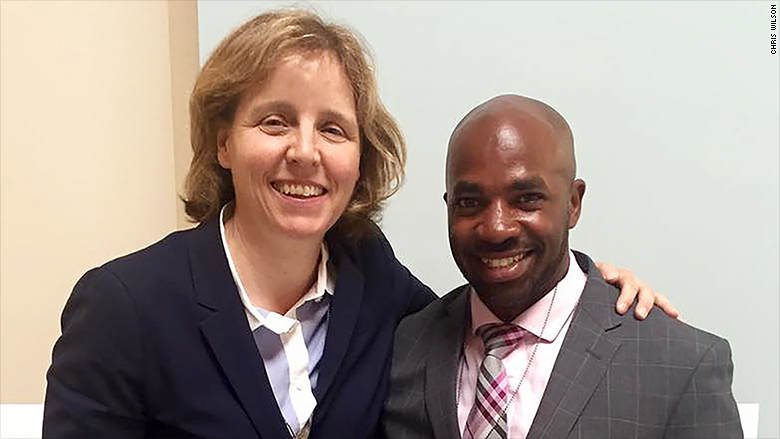 Wilson with White House CTO Megan Smith on Tuesday. "I didn't have someone like me growing up," said Wilson. He was just a teen when he witnessed his mother being raped and beaten by a police officer she was dating. Then, at 16, he was kidnapped at gunpoint. After he was freed, he recalls his mother and family laughing at him for being kidnapped, especially because he had been carrying a gun. "There was no compassion," said Wilson, who credits therapy with helping him become who he is today. "That moment made me colder. It put me in a dark state." He vowed to never let it happen again -- which ultimately led to his crime and prison sentence. Now, Wilson wants to help others like him. "I feel like there's a need for me to play this role," he said. But it doesn't come easy when you're an ex-con. "No banks were interested in providing me with a loan," he said, noting that he needed to show two years of tax returns and collateral against the loan -- not to mention that he has a criminal record. Eventually, he was able to take out several lines of credit through a relationship with the vice president at Harbor Bank. In exchange for the credit line, he was expected to create 16 local jobs. "These relationships were the missing pieces to building up my companies and creating more job opportunities," he said. As for Edwards? He was also released early, after serving 20 years, and heads up a software company today. He and Wilson still talk every day on the phone.